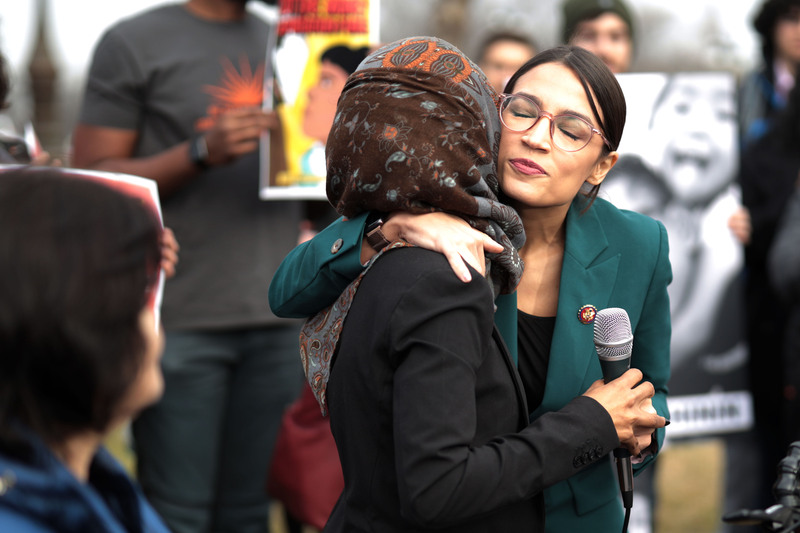 Democrat New York Rep. Alexandria Ocasio-Cortez praised fellow Democrat, Minnesota Rep. Ilhan Omar, on Tuesday for claiming Republicans’ support for Israel is bought by the American Israel Public Affairs Committee (AIPAC). Unlike this President, Rep. @IlhanMN demonstrated a capacity to acknowledge pain & apologize, use the opportunity to learn abt history of antisemitism,+grow from it while clarifying her stance. Omar is facing massive backlash after she quote-tweeted a link to an article by Haaretz where House Minority Leader Kevin McCarthy threatened punishment against Omar and Democratic Michigan Rep. Rashida Tlaib, America’s first two Muslim congresswomen; both Omar and Tlaib have been embroiled in allegations of anti-Semitism. The comments received swift condemnation from members of congress on both sides of the aisle, including from House Speaker Nancy Pelosi and the Democratic leadership. While Omar has been in office less than two months, she’s been surrounded by a number of controversies involving anti-Semitism. The freshman congresswoman defended anti-Israeli statements, such as ones invoking Allah to expose Israel’s “evil doings,” and she has come out in favor of the Boycott, Divestment and Sanctions (BDS) movement, which seeks to punish the nation-state of Israel by economically depriving the country for its alleged mistreatment of Palestinians living in the Gaza Strip and West Bank. While Ocasio-Cortez claimed to have Sephardic Jewish ancestry, she has also made some eyebrow raising statements about Jews. The self-proclaimed radical compared a migrant caravan trying to enter the United States illegally to Jews fleeing the Holocaust. She later compared the effects of Democratic President Franklin D. Roosevelt’s New Deal to the Holocaust, urging the United States to follow Germany’s example by paying reparations and acknowledge the suffering that occurred during Nazi occupation. The New York congresswoman also received backlash after she expressed gratitude for her correspondence with Jeremy Corbyn, the leader of U.K.’s Labour Party. Corbyn has been plagued with accusations of anti-Semitism and has a long history of condemning Israel while applauding anti-Jewish terrorist organizations. Ocasio-Cortez is part of the Democratic Socialists of America (DSA) that supports BDS. The Daily Wire uncovered a 2017 video of DSA voting in favor of BDS while chanting “from the river to the sea, Palestine will be free,” a famous Hamas rallying cry.